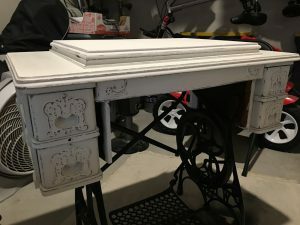 I have never been one to get my hands dirty, (I’m a little on the girly side) so when my mom asked me a while back if I wanted her antique sewing machine that had been in her house for as long as I could remember, I was a little reluctant to say yes. At the same time though, I just couldn’t resist it. This sewing machine was my Great-Great Grandmother’s and my mom had taken it on when she passed away. I can remember this sewing machine growing up, playing with the iron foot peddle as a little girl and thinking how amazing it was that they actually used this thing to sew back in the day. I knew that my husband was going to hate it as he has a very modern style and this piece is nothing close to modern. Plus I knew that it was going to need a lot of work. 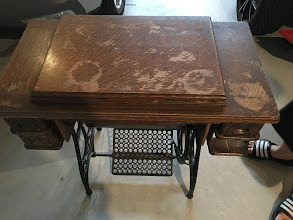 It had been used as a side table at my parent’s very busy house and had the war wounds to show for it. All that aside, I had to take it. Initially I thought I would hire someone else to restore it. 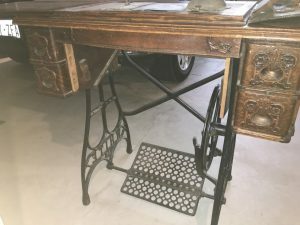 As I said, restoration was not my cup of tea and I was not about to start with a family heirloom antique sewing machine. I began reaching out to different furniture repair shops but no one would touch it (or call me back for that matter). 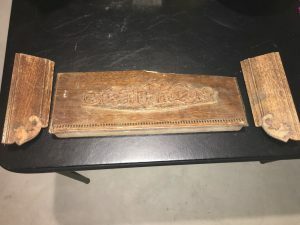 So I went to a few antique shops and spoke with the owners to see if they might have some resources that I could take advantage of. They all gave me the same answer: YOU CAN TOTALLY DO THIS YOURSELF!! I thought they were crazy, but I was curious. 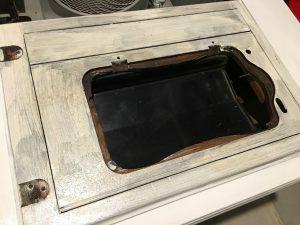 I spent the next few days glued to Pinterest (sorry kids) researching how to use chalk paint and restore the sewing machine that was just waiting for life to be brought back to it. The more I read the more confident and excited I became, but I wasn’t ready to do it on my own; I needed back up. I called my mom and asked her to come to town and help me out (she lives in Oregon). 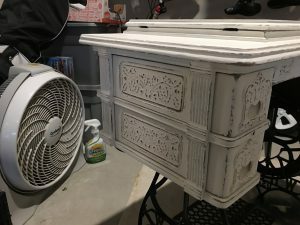 We were both new to chalk paint, so we went to our local Vintage Shop, The Vintage Company #7, for a little tutorial. Sandra, the shop owner there was so helpful. She set us up with everything we would need and sent us on our way. Large chalk paint brush. I would have purchased a smaller sized brush, but we were doing a full sized head board at the same time, so I went with the larger one. I should mention, we did end up going back and purchasing a smaller brush. Finishing Was. Again DIY Brand. Once we were home we got to work. We took the sewing machine apart as much as we felt necessary. 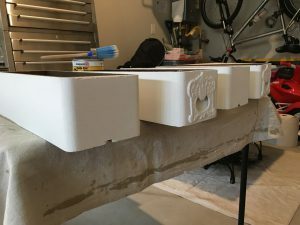 The top was in pretty bad shape, so we sanded that down a little to get rid of the water stains. And then we got to painting. The great thing about chalk paint is that you don’t need to do a lot of prep work. 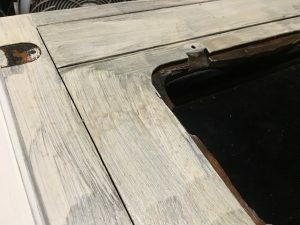 There is really no need to sand off the original finish as the chalk paint will go right over the top. I noticed with the first coat that I wasn’t getting the coverage that I was expecting and the original stain was starting to bleed through. The 2nd coat was still having the same results. I looked online and found that is something that can happen from time to time depending on the original stain. You just need to go over it with a Shellac. 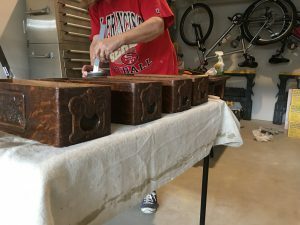 It will seal in the original stain and can go on right over the paint that I had already done. We headed down to Home Depot, and were ready to keep going. I put the Shellac on that same day, it did leave a yellowish tint, but I wasn’t concerned as I was going to be painting right over it. The next day I applied a 3rd coat of chalk paint but the stain was still bleeding through slightly. So I added another layer of Shellac and then a 4th coat of chalk paint. Finally I had gotten the coverage that I wanted and none of the stain was bleeding through. 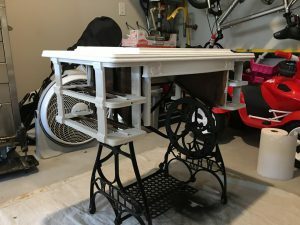 I had originally thought that I was not going to distress the sewing machine as I thought it would look great in a stark white with the contrast of the black base, so I went ahead and applied a coat of the wax on the entire piece. The problem was I just wasn’t falling in love with it. It lacked something. It almost felt like it was trying to look too perfect, for the old, over used, utility piece that it is. Distressing it seemed so intimidating; I felt like I was going to somehow mess it up but I knew it needed it. I started distressing on the back of the sewing machine, just to see if I liked it and get my bearings. The second I started sanding is the second I started falling in love with this piece and the more I distressed, the more I fell in love. I realized the thing with distressing was the beauty in the imperfect, and that I couldn’t mess it up. 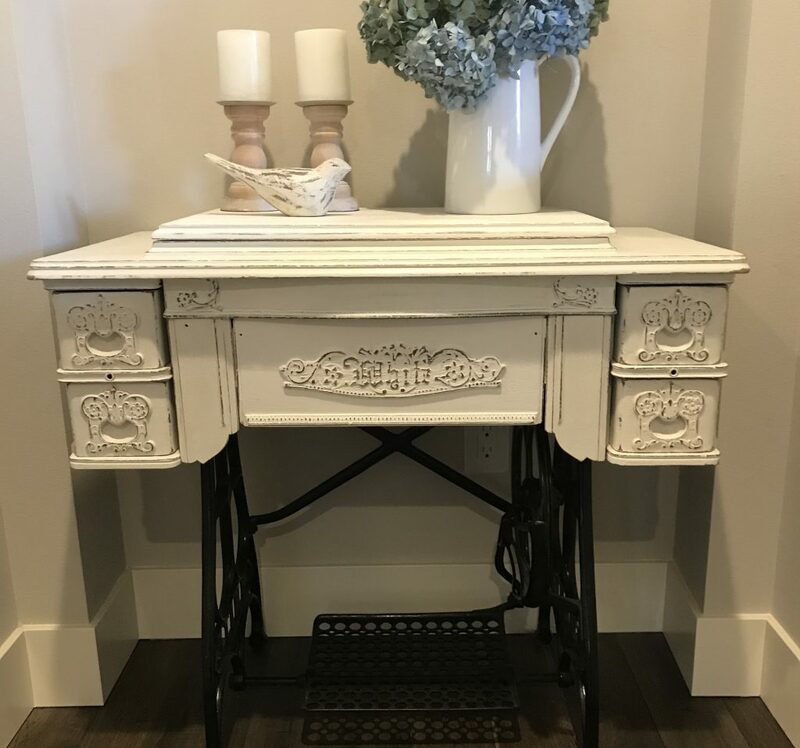 As I sanded over the flower details on the drawers the piece really came to life. I was so completely in love with this piece and couldn’t wait to get it in my house. I did learn a lot through this process, some practical lessons to use on my next projects (yes, there will be more). First, with dark stains I will always put a couple coats of Shellac on just so that the stain doesn’t bleed through, and save myself a few layers of paint. I also would have watered down the paint a little (you can do that with chalk paint), because it was very think. I also learned that I love chalk paint. You cannot mess this stuff up. You can wipe it off with water if you don’t like it. If you get it on your clothes it comes off with water. There are no fumes that you have to worry about. The brushed clean with just water. Lastly, I learned that I LOVE distressing! It is almost therapeutic to give something character like that. I just couldn’t get enough of it. I can’t wait to hunt down my next project. This is so beautiful! 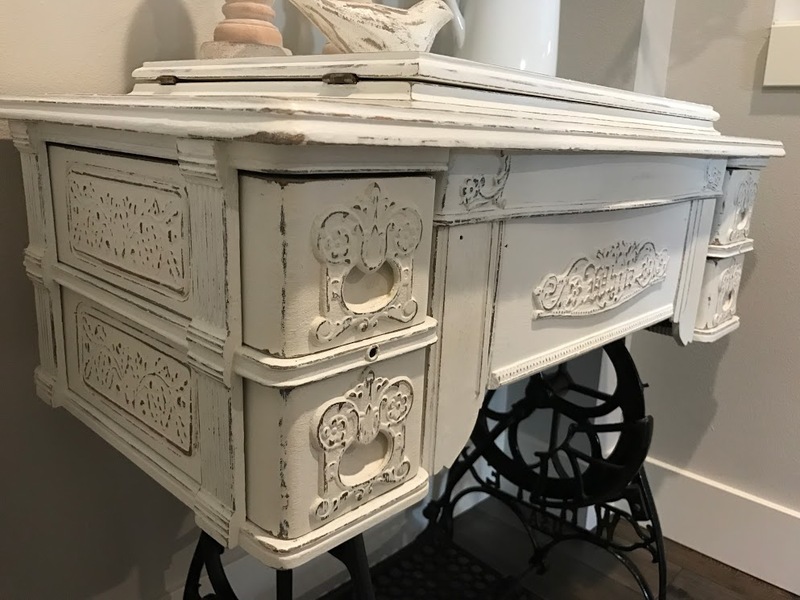 I love refinishing furniture because old finds like this are far more interesting and unique thank anything you would find at a store… I drive my husband crazy with it because we have a toddler and it is a little more time consuming than what we have time for these days, but it is just so pretty! Thank you! My husband is the same way:) And my projects always end up taking way longer than I think they are going to, but it is so worth it in the end.